Welcome to #17MinutesStronger—an archive of short, sweaty HIIT workouts. Test-drive six sample workouts below, or sign up for my newsletter and receive FREE access to the full archive of demo videos. It’s easy to give up on exercise when you’re pressed for time and don’t have a plan. Now you do! Pick any workout, set a timer, and get moving! HIIT is an acronym for “high-intensity interval training.” It means you alternate between a short burst of high-intensity work (usually 20 seconds to 1 minute) followed by a short rest or period of low-intensity work (for example, a slower exercise). HIIT gets the heart rate up, then brings it down. You move with maximum effort for a short period; then you get a moderate recovery so your body can restock ATP energy stores. The resting interval is just as important as the working interval. HIIT has been shown to increase EPOC (post-exercise oxygen uptake), which increases post-workout metabolism better than traditional steady-state cardio. So you get an intense workout in a shorter period of time. Challenge yourself! Pick exercises you hate (you’ll get better and hate them less, I promise). Move as quickly as possible with good form. If your form starts to suffer, back off a little. 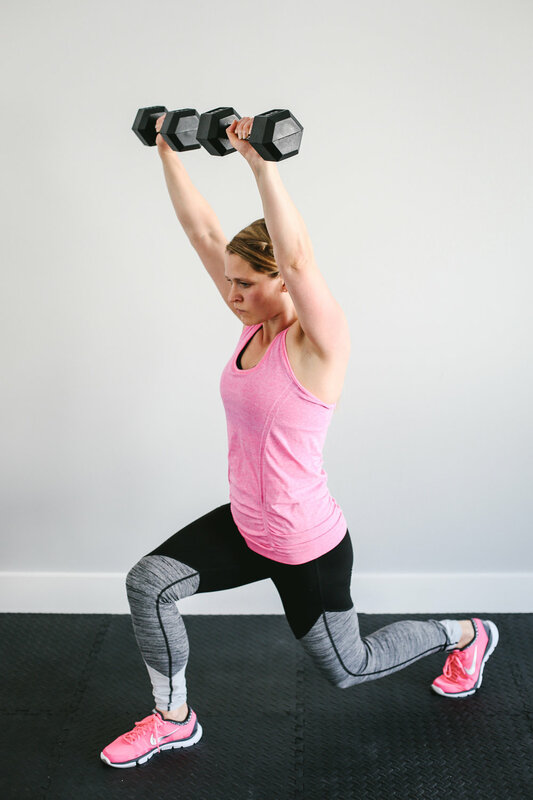 Pick up a weight you can lift for 12–18 reps during the working interval. If you consistently do more reps or it feels easy, pick up a heavier weight. Push hard and really test your limits. If you need to pause before your high-intensity interval is up, give yourself 2–3 seconds to rest, say “go,” and jump back in. Just get moving, even if it’s slow. If you have an off day, no biggie.